Sixth-grader Elizabeth Mealing launched into song to attract a new feathered friend. Domesticated chickens have been bred by humans from Asian jungle fowl. Chickens can remember and recognize over 100 individuals; they can also recognize humans. Chickens have very sophisticated social behavior, with a dominance hierarchy where higher individuals dominate subordinate individuals. This is where the term ‘pecking order’ comes from. Chickens perform complex communication where calls have specific meanings. They perform over 30 types of vocalization, with meanings varying from calling youngsters, alarm calls and alerting others to the whereabouts of food. Chickens can comprehend that when an object is taken away and hidden from them, it still exists. Young human children are unable to understand this. 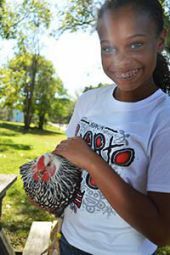 It was Chicken Adoption Day at Grand Rapids Public Schools Blandford Middle School, where every year students operate a chicken business, complete with feeding, coop cleanup, egg gathering and selling. The fun starts each September when the bonding begins between student and hen with specially penned chicken odes. While the birds flapped and pecked, students sat to serenade them, inviting one to climb onto their laps and become their one and only. 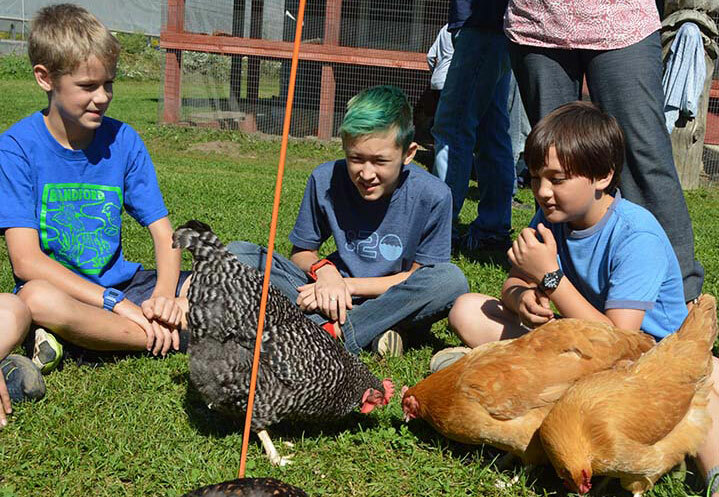 It took some clucking, coaxing and a little grass to bait the distracted birds, but eventually all 60 students had chickens nestled in their arms. Students then christened each with a name and signed an official adoption certificate. “I’m looking forward to just loving my chicken,” said Zamora Harris-Tamminga, who graced hers with the stately name, Hedwig (quite familiar to Harry Potter fans). Zamora knows the importance of a good name. 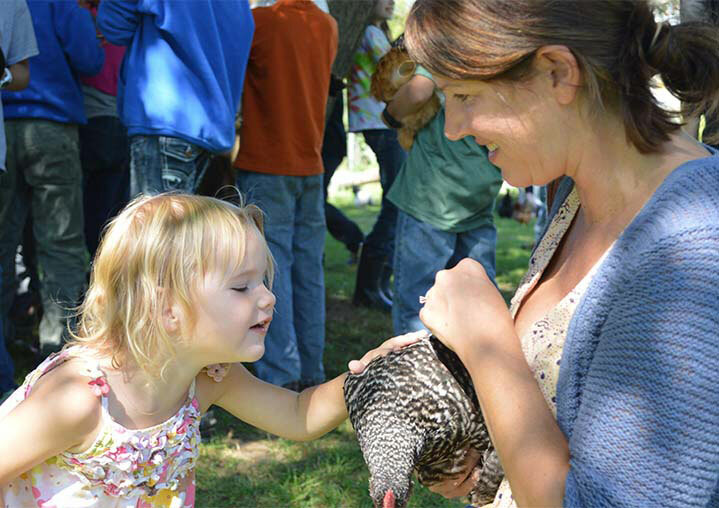 “By the end of the year, the chickens will come when we call them,” she said. Students continue to care for the birds over the summer, until they are turned over to a new group of students, with new names. Communication is one skill Blandford students will learn by working with the birds over the school year. Located at Blandford Nature Center, on Grand Rapids’ West Side, the 42-year-old, sixth-grade-only school immerses students into environmental education. The chicken operation has been part of the curriculum for decades. “They run the whole thing,” said teacher Bob Rizkalla. An elected student board comprises a president and student committees focused on management, sales, finance, publishing, marketing and research. Students are in charge of tracking profit, which goes back to Blandford programs. The many dimensions of the business connect with math, science, writing and economics, Rizkalla said. Meg Voetberg, this year’s chicken president, snuggled with her newly named chicken, Laura. 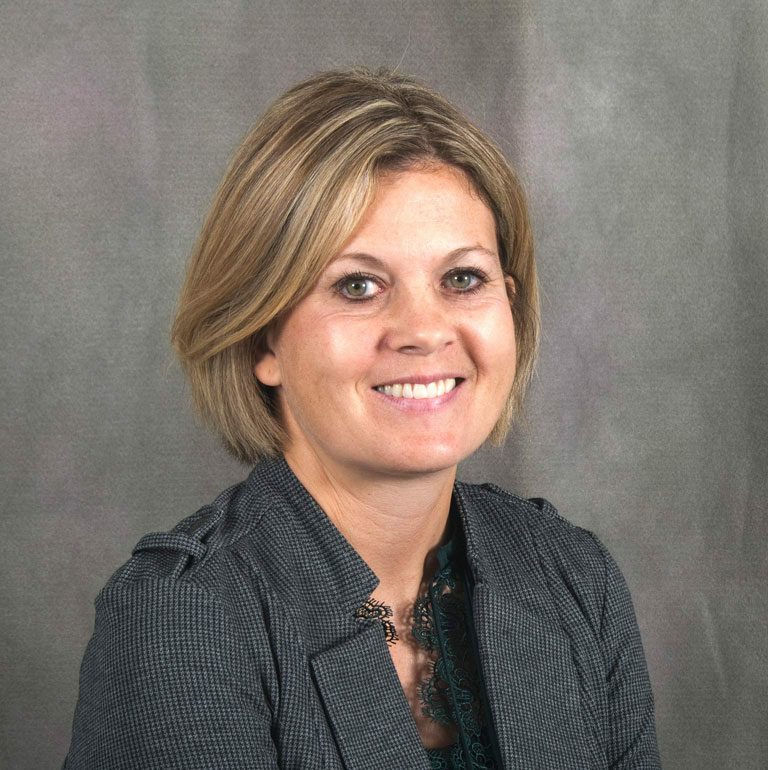 “I’m really looking forward to being able to see what happens with the business and where we can go with it,” she said.